3 Four men arrived carrying a paralyzed man on a mat. 4 They couldn’t get to Jesus through the crowd, so they dug through the clay roof above his head. Then they lowered the sick man on his mat, right down in front of Jesus. As in scene 01, I have set the scene mid morning. Strong sunlight comes from the above, casting strong shadows into the scene. 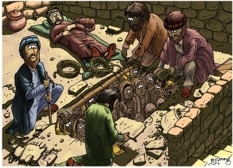 The 4 friends, digging through the clay roof of the house, & the paralysed man on his mat. One of the friends is tying ropes to his mat, which will be used to lower him down in front of Jesus. There is small grey mouse poking its head out between the parapet’s wall stones, in the top left corner of the cartoon. You can see the yellow (sun lit) steps on the right of this scene which lead down to ground level. In scene 01 – Crowd there were 2 children sitting on the steps. I like to add a mouse of similar creature to my scenes, just for fun! The website Nazareth Village (http://www.nazarethvillage.com) has some interesting articles about 1st century Palestinian building methods & materials.